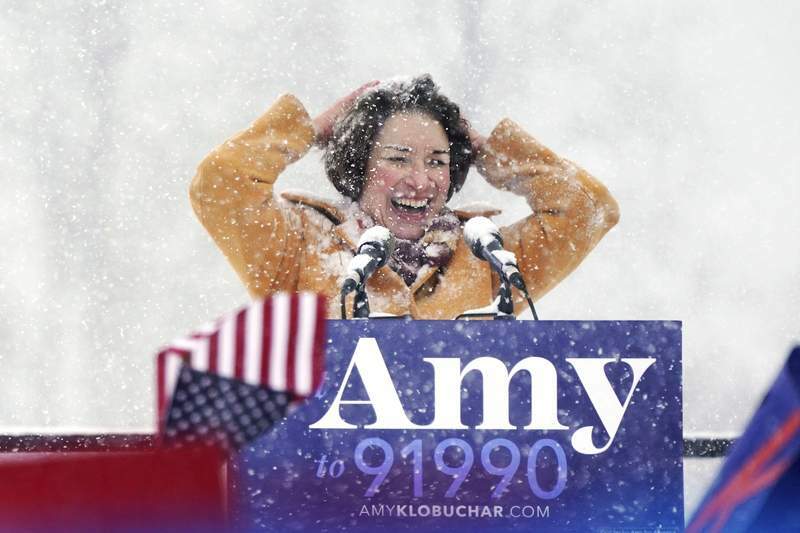 Associated Press Democratic U.S. Sen. Amy Klobuchar wipes snow from her hair after announcing she is running for president of the United States at Boom Island Park in Minneapolis on Sunday. “For every American, I'm running for you,” she told an exuberant crowd gathered on a freezing, snowy afternoon at a park along the Mississippi River with the Minneapolis skyline in the background. “And I promise you this: As your president, I will look you in the eye. I will tell you what I think. I will focus on getting things done. That's what I've done my whole life. And no matter what, I'll lead from the heart,” the three-term senator said. Klobuchar, 58, who has prided herself for achieving results through bipartisan cooperation, did not utter Trump's name during her kickoff speech. But she did bemoan the conduct of “foreign policy by tweet” and said Americans must “stop the fear-mongering and stop the hate. ... We all live in the same country of shared dreams.” And she said that on her first day as president, she would have the U.S. rejoin an international climate agreement that Trump has withdrawn from. Trump responded to Klobuchar's announcement with a tweet mocking her stance on global warming, a phenomenon he has disputed in the past. He wrote that Klobuchar talked proudly “of fighting global warming while standing in a virtual blizzard of snow, ice and freezing temperatures. Bad timing. By the end of her speech she looked like a Snowman(woman)!” Trump often overlooks evidence of record global warming and conflates cold spells and other incidents of weather with climate, which is long-term. The list of Democrats already in the race features several better-known senators with the ability to raise huge amounts of money – Elizabeth Warren of Massachusetts, Kamala Harris of California, Cory Booker of New Jersey and Kirsten Gillibrand of New York. The field soon could expand to include Vice President Joe Biden of Delaware and Vermont Sen. Bernie Sanders. Klobuchar's focus in recent months has included prescription drug prices, a new farm bill and election security. She supports the “Green New Deal,” a Democratic plan proposed to combat climate change and create thousands of jobs in renewable energy. Klobuchar on Sunday responded to reports in BuzzFeed and HuffPost that she has mistreated staff, saying she “can be tough” but has many staff members who've worked for her for many years.